These are simple and FAST. I don't have much time these days, so I'm loving the Little Reminders Tin. The only stamp sets used were Much Appreciated and Small Script. 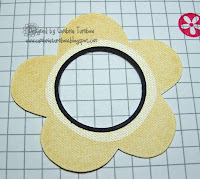 This pattern was shared by my friend Kendra and she saw it at a Stampin'Up Regional she attended. Thanks Kendra!! 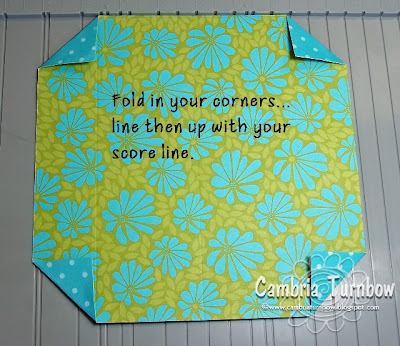 This one opens from the opposite direction, but there are tons of options with this cool pattern. See my other version here. 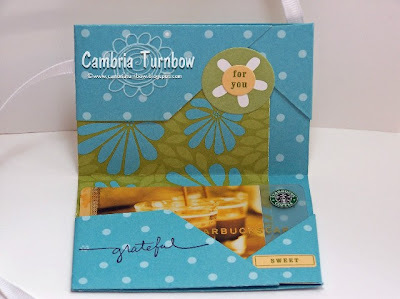 I added more accents from the Little Reminders Tin on the inside of this one and inserted the gift card in the bottom. 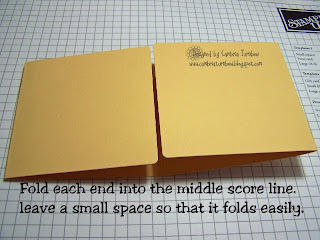 If you were giving two gift cards, you could slide one on top and one in the bottom, or slide a note card up in the top also. 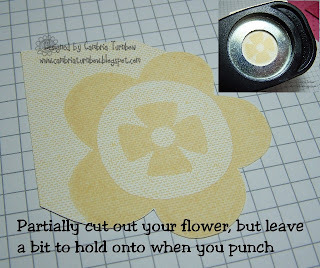 I used the Round Tab Punch, made a little tab and then added one of the die cuts from the Little Reminder Tin over the top, stamped thanks and added a flower too. 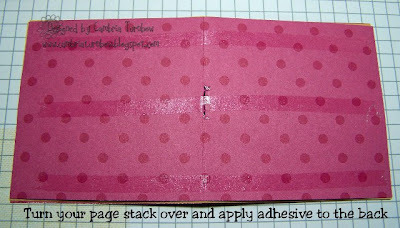 That is my little "card" part, where I will write a note. It also pulls out. 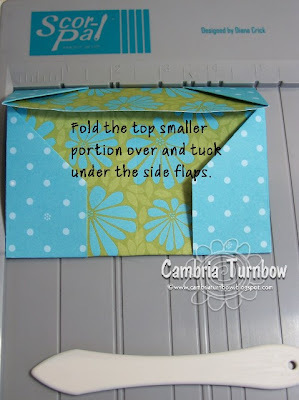 These are SO easy and totally folded from one piece of 8 x 8 designer paper. I'm working on a tutorial and will post it tonight. This is a view of the back. 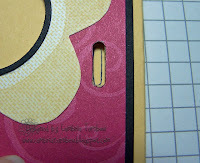 I used the slot punch to make a little slot for the ribbon. 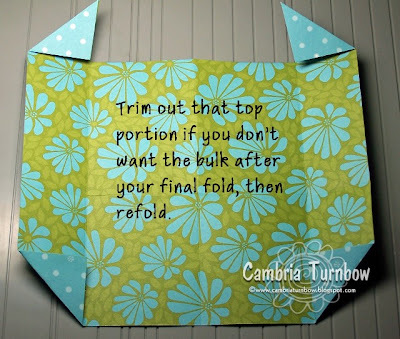 Because it is just folded, you can tweak it many different ways. Other: Grosgrain Ribbon (Apricot), Crafter's Tool Kit, Accents & Elements Little Reminder Tin, Slot Punch, Round Tab Punch, Stamp-a-ma-jig. Be right back after dinner with the tutorial. Thanks for visiting! 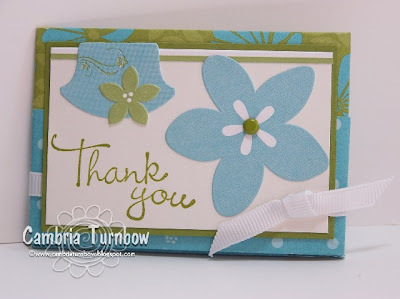 I needed a quick gift certificate for one of my customers (they are so good to each other... I love them). 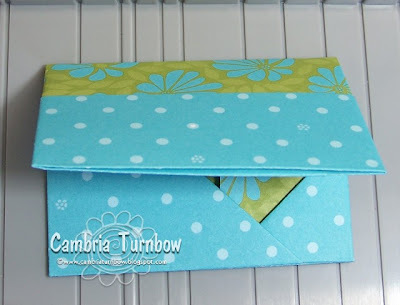 I was reminded of these easy envelope holders from my friend Mish who recently made some adorable ones (love all that she does). 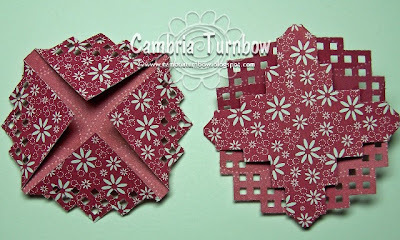 I used my pretty shimmery envelopes for some extra sparkle and stamped them with the flowers from the Office Accoutrement set in the Spring Mini in pink passion and old olive. 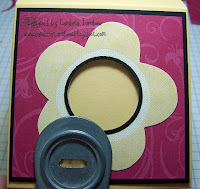 I used the die cut stickers from the Accents and Elements Little Reminders tin to touch em off. I made a gift card using Microsoft Picture It! 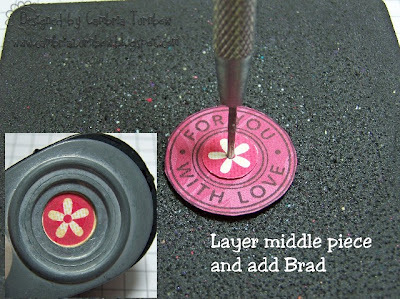 with the business card format and then printed it out on Whisper white, trimmed it and added an olive layer and a pink passion tab with the new Round Tab Punch. 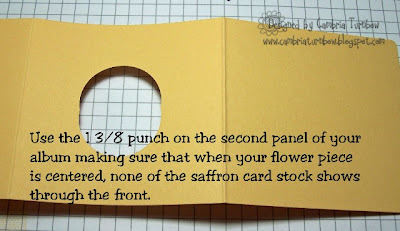 Then added more die cut stickers again to the inside from the Little Reminders Tin. I left a space on the inside for my customer to write a message. These are easy peasy. 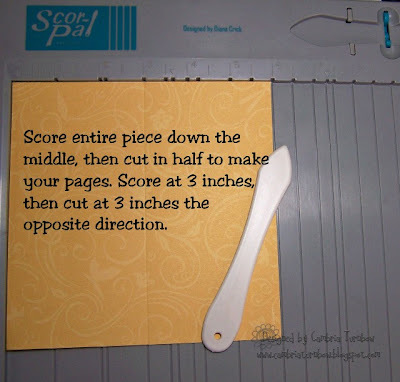 Just take an envelope, fold it in half, take the flap and cut down on the center fold. Tuck the right side in, and lick and seal the left side. A perfect pocket. 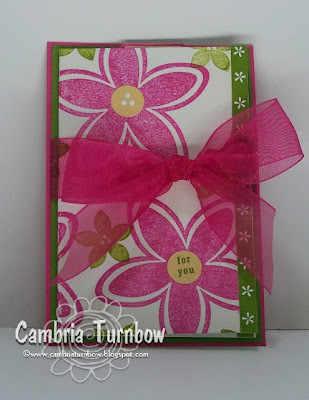 Layer it on some card stock and add some ribbon and you have a neat little gift card. I'm waiting for UPS to bring a big order for my girls. I can't wait for my customer to see her gift certificate. She is THE sweetest person. I hope she knows how much we all appreciate her friendship. :) I KNOW she'll have fun shopping! Have a super day everyone.... thanks for stopping by. Happy birthday my sweet friend! I absolutely ADORE Joy (yes, here real name is Joy...well, REALLY Emily, but you all know her as Joy). I met Mounds, on SCS years ago... she was always so sweet and funny. In one of those fun threads, I called her my Mounds of Joy, like the candy, and from there it was shortened to Mounds. 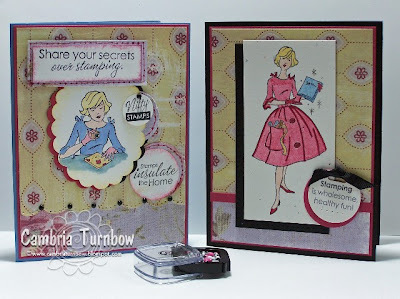 I met her IRL last September at a stampin retreat in WI. We flew out together after hooking up in Vegas (our flights that is). I was SO nervous to meet her... I talked her ear off until 3:00 am. You know how you meet some people and they just have an aura (ora? How do you spell that? ), okay VIBE... you know how you just get a certain vibe? Mounds has that... she exudes love and friendship and warmth. She is someone that I am honored to call my friend. I am so freaking lucky when it comes to the friend dept. 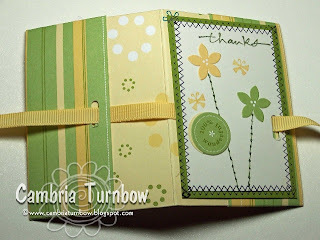 That stampin retreat was THE best time evah.... I made life long friends from that trip. So, if you have some time today, head on over to Mound's blog and wish her a happy birthday!! I love you Mounds!! Hope your day is as AWESBOMB as you baby!!!! 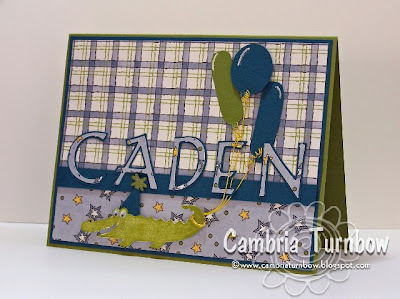 My sweet friend Heather's little boy Caden turns one this weekend. It's SO hard to believe a year has gone by. I wanted to send a card, but my mojo is missing. This took me two days to finish. LOL. 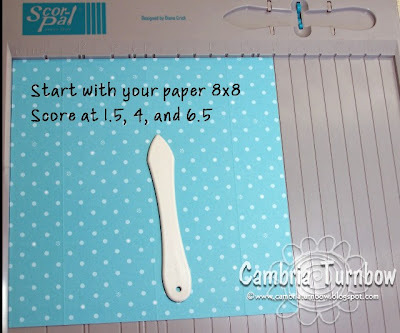 The paper is from the retired Scrappin Kit Toy Box. I LOVE that paper. I wish I had hoarded more of it. The letters and balloons were done with my Cricut machine. I need to use that thing more. The balloon strings are done Stampin'Up! 's wire works. I twirled the ends with the poker thingie from the Crafter's Tool Kit by wrapping it around the tip. 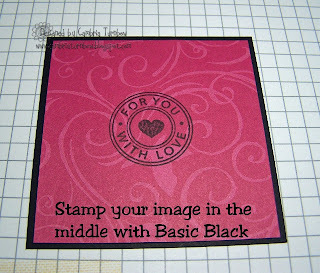 Stamp set is Wild About You. I hope Caden had a wonderful birthday party... knowing his Mom.. I'm sure it was THE best. :) Happy Birthday sweet little man!! Hope you are all having a wonderful weekend. It's been beautiful here on the OR coast. 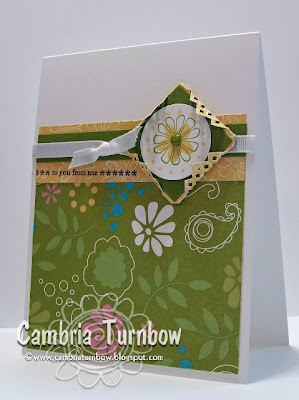 This is one of the cards we did this weekend with my hostess club. Another great idea from SUDSOL, created by the brilliant Diane. 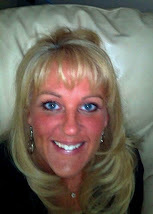 (she had a GREAT blog... click on her name). I just took the pattern and tweaked it a bit. I did four different designs all starting with the same basic pattern. 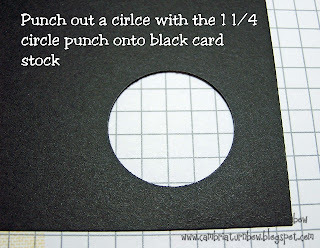 This is super easy to do and it's kinda cool for little images or even more punches... you know how I LOVE my punches! 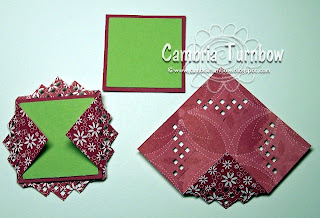 Take a piece of card stock or designer paper, here I used a 2x2 piece of Designer paper from the Palette O' Prints. 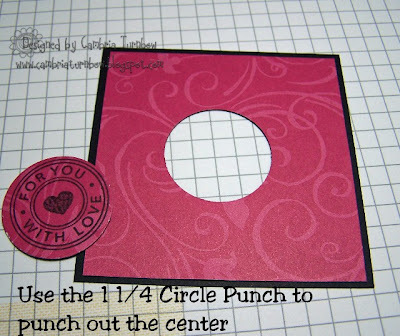 Use the Square Steps Corner punch on each corner making sure that the punch is pushed all the way in each time. 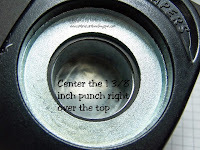 Then, gently just flip the corners out. 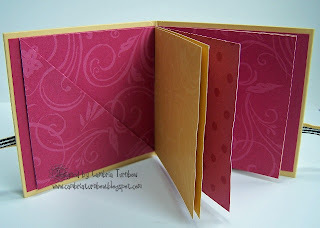 On this card, I layered two square pieces of card stock with the 1 3/8 and 1 1/4 inch square punches and placed them in the center with two of the flaps under and two over. 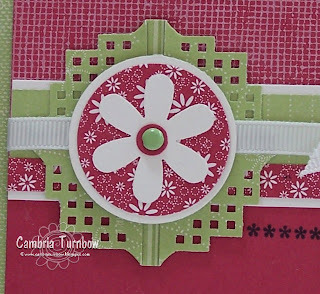 The colors are actually certainly celery and rose red to match the designer paper on the card. This photo shows what the front and back look like... you can see both make a really cool pattern. 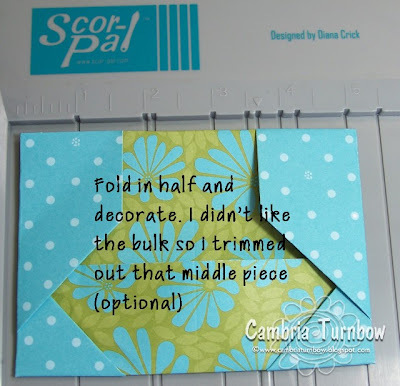 Place your layered squares in the center over two flaps, then slide your piece under the ribbon on your card, then fold the top layers. 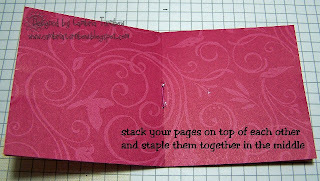 I put a little glue under the top flap and wait until I have that whole piece centered before I glue it on the card to glue the last flap. 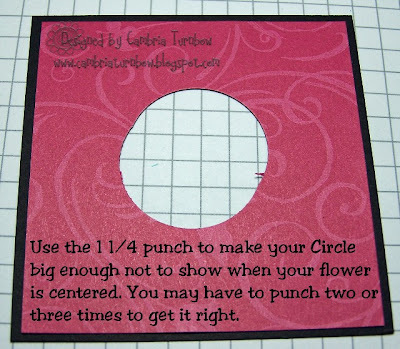 Add two dimensionals on your top layer ( 1 3/8 and 1 1/4 inch circle punches)and center it on the front. 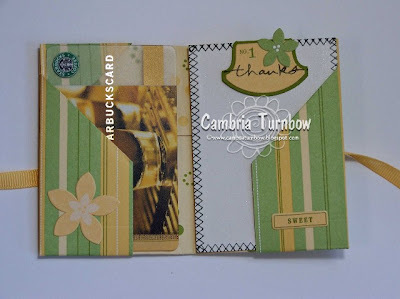 This gives it a really nice layered look. 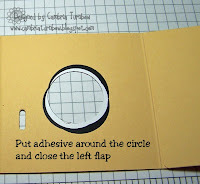 Cut your strip that goes through the center at 7/8. This photo shows the opposite side once your strip is through the middle. 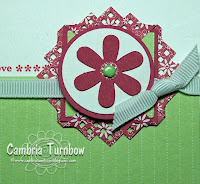 I also added ribbon to the card sample in the photo. 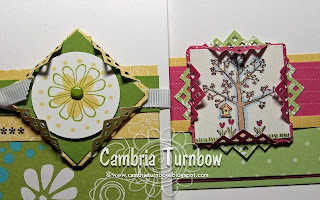 Here are two cards I made with the new Palette O' Prints and Petals & Paisleys Designer paper. 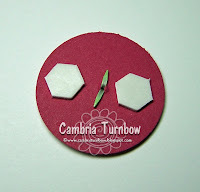 For this version, place your square image in the center of the lattice side (not the X side) and then take your bone folder and carefully fold over the little lattice tabs. 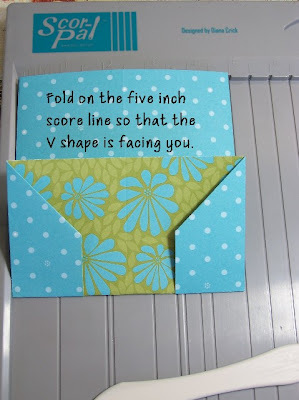 On the first card, I did double layers. 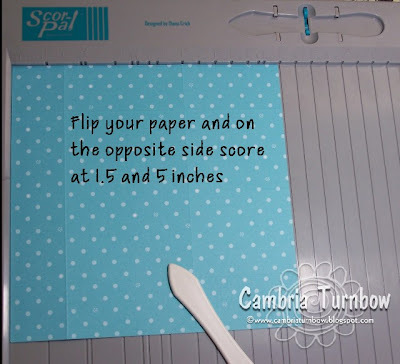 The first one is a slide frame, (cut your card stock 7/8 of an inch and it will slide in through the middle), but I used the opposite side that the previous card I showed you. 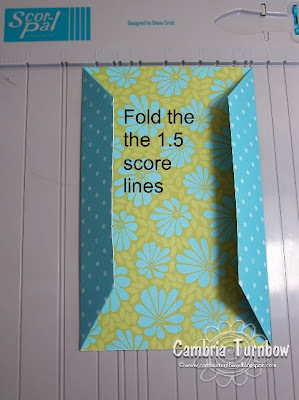 Then, you make another frame, fold over the flaps and center it over the top. Here is a close up of both frames. You can click on the photo to see a bigger version. 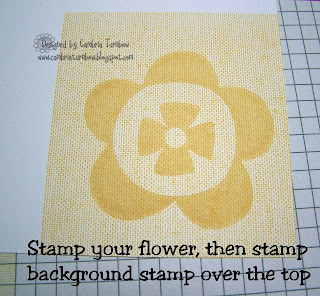 The stamps sets used were Polka Dots and Petals and A Tree for All Seasons. Thanks so much for all the wonderful comments. I LOVE seeing everyone's ideas and versions. My new 2nd downline Nancy Littrell did one with the Wrought Iron punch too. Click on her name to check em out baby. 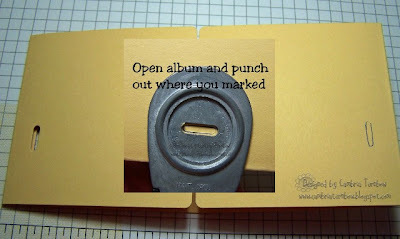 Have I told you how much I LOVE punches? LOL. Okay... off to get my groceries put away and get some dinner going for the gang. Hope you all had a great day! Thanks for stopping by!! 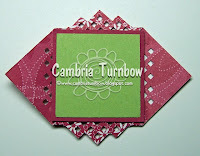 I got some images along with a little challenge from my friend Jami . I don't have this set, and now it's retiring, so it was fun to play with the images. I used them all Jami! :) Thanks babe! 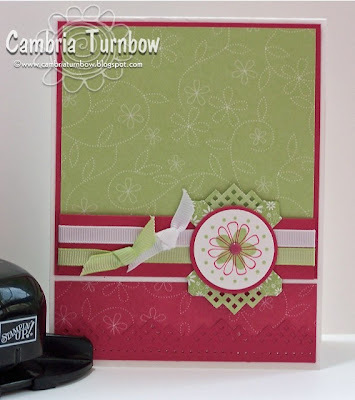 Designer paper is from My Mind's Eye, card stock is Stampin'Up! 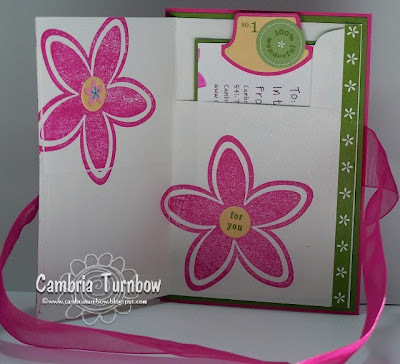 Stamp set is Stampin' Fun For Everyone.... better hurry and get it while you can girls. Tiny little mini brads are from Queen & Co., a gift from my friend Heather. 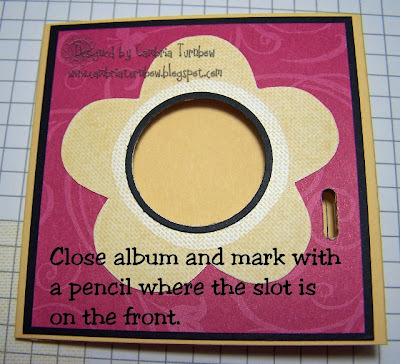 Images colored with Stampin'Write Markers. 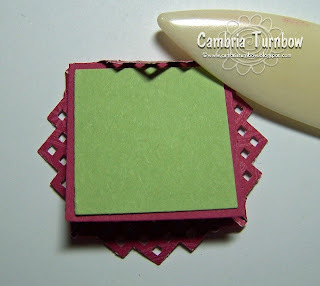 Oval Scalloped punch is by Mary Uchida. 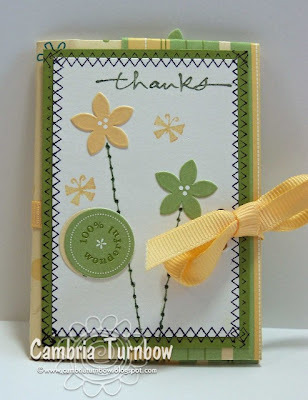 Everything else is from Stampin Up!. 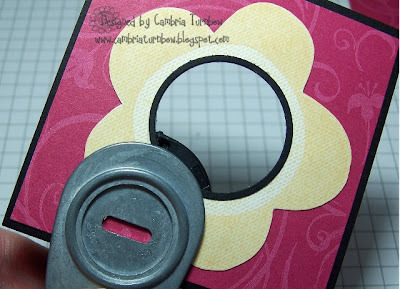 Circle Punch, Slot Punch, Corner Rounder Punch (scallops), Crafer's Tool Kit, Grosgrain Ribbon, Dimensionls. 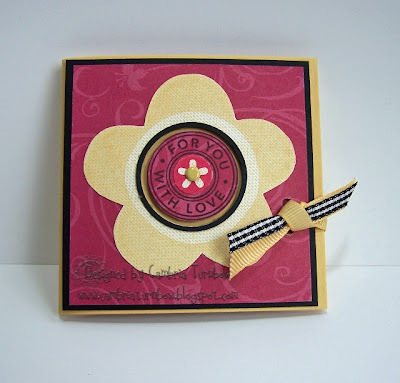 I've been so busy, it felt good to sit down and do some fun stampin. Thanks Jami girl! I had a workshop today, so hopefully tomorrow I can find some time to share more!